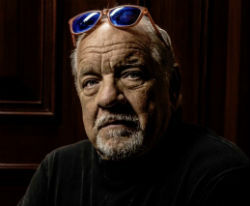 When Director Paul Schrader lost control over the movie “Dying of the Light,” he decided to make his own cut from the raw material. The ‘unauthorized’ movie was never shown in theaters, but it’s currently playing at The Pirate Bay. “It is for historical record,” Schrader notes. The writer-director’s more recent movies haven’t been all a success and Schrader suffered setbacks on other fronts as well. In 2014 he lost control over the movie “Dying Of The Light.” The film was taken over by others after the first cut and was re-edited and released without his input. This caused quite a stir at the time. When Lionsgate subsidiary Grindstone released the poster and trailer the director and others were not happy. However, because of a “non-disparagement” clause, they had to stay silent. “Here we are, Nick Cage, Anton Yelchin, Nic Refn and myself, wearing our ‘non-disparagement’ T shirts,” Schrader wrote at the time. Although it was not an option to burn the film to the ground, verbally, the director didn’t let the project go completely. Instead, he decided to go rogue and create his own cut, on his own terms. Early last year the director gave a ‘making off’ masterclass at the Rotterdam Film Festival, which is available on YouTube, and a detailed writeup on Indiewire shows how much of a challenge the project was. The latter article also has an interesting comment section where someone suggested putting a copy of “Dark” on torrent sites. 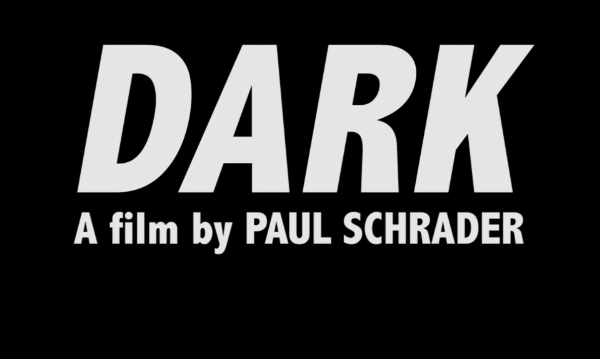 “If it can’t be released in a commercial way, why don’t they use a torrent site to distribute ‘Dark’ worldwide? You’ll reach a much bigger audience & it would be a perfect fit for this subversive enterprise,” Carter wrote. Whether Schrader saw this comment or not, he did indeed release a ‘torrent’ of the movie. This was revealed in an interview with Vulture this week. “I made ‘Dog Eat Dog’ to redeem myself from the humiliation of ‘Dying of the Light,’ which was taken away from me. Nic [Cage] and I disowned it, I subsequently did my own edit, put it on torrent,…” he said. The article itself doesn’t go into more detail, but we were rather intrigued and started digging. This search eventually led us to a torrent that was uploaded to The Pirate Bay a few months ago. TorrentFreak reached out to Schrader to confirm that this is indeed the copy he uploaded, but we haven’t heard back yet. This is, however, the earliest upload of “Dark” we could find. What we also know is that the user in question tried to upload the torrent to The Pirate Bay several times, up to the point where the account was banned. A month later, another version was uploaded to the site which is still well-seeded. 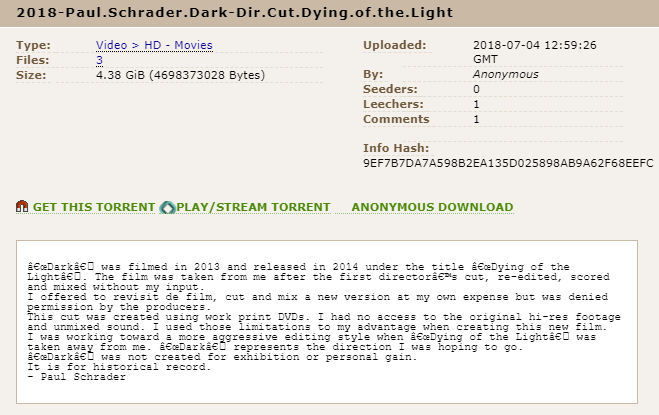 Schrader doesn’t go into detail why he chose to share the film on The Pirate Bay, but we assume that it’s a defiant move to make it available worldwide, as was suggested. Since he doesn’t own the exclusive rights to the footage, this may lead to potential copyright troubles, but we doubt that the rightsholders want to rattle this case. For those who prefer to see the movie without venturing into the tricky waters of The Pirate Bay, Schrader also has some offline options. “A digital file of the film can be seen by prior request at the UCLA Film Archives in Los Angeles, the Harry Ransom Center at the University of Texas, Austin and the Museum of Modern Art film department in New York City,” he writes. The Pirate Bay team, meanwhile, informs TorrentFreak that Schrader can have his account reinstated if he wishes.